Travel report by Joseph Wilhelm - When Rapunzel initiated the One World Award (OWA) I decided to visit the award winners in their respective home countries. In doing so I want to learn more about the rewarded activities. Most importantly, these visits enable me to stay in touch with the award winners and help to strengthen the relationship with them. This way we can also support additional projects – making the OWA a truly sustainable event. In recent years, I already visited two OWA winners. At the end of 2013 I visited several Rapunzel suppliers in Asia and used this occasion to travel to the Philippines to Mayor Jun, the OWA winner 2012. Mayor Jun, whose full name is Nacianceno Mejos Pacalioga, lives in the provincial town of Dumingag on Mindanao, the second largest island of the Philippines. In order to get there we travelled to Manila, the capital of the Philippines and from there to Ozamis City. From the airport in Ozamis City it took us another two hours by car to Dumingag. In the provincial capital town of Dumingag live about 10,000 people. The entire municipality of Dumingag comprises another 40,000 people who live in almost 50 smaller communities, hamlets and innumerable homesteads. Mayor Jun is responsible for the entire municipality; currently he is in his second term as mayor. The task to transform his municipality into a “sustainable organic community” is his most important mission. Most of the inhabitants of Dumingag are peasants who farm small plots with an average area of 1.5 hectares. The emphasis is on organic cultivation in order to improve the lives and the well-being of the people in the different communities. At the same time, organic cultivation helps the farmers to be less dependent on multinational corporations and their obscure business dealings. 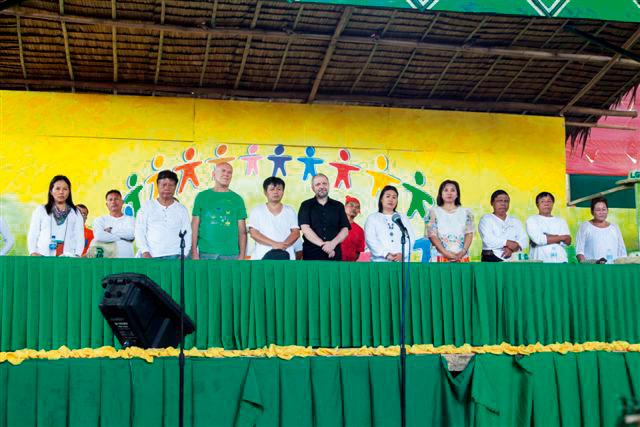 The visitors were given seats of honor on the grandstand at the opening of the Organic and Cultural Festival. Since alcoholism and excessive tobacco consumption are major problems on the Philippines, Mayor Jun organized very successful anti-drinking and anti-smoking campaigns. For these campaigns he was already recognized by the WHO (World Health Organization). Using best leadership style, Mayor Jun succeeds to actively involve the people of his municipality in his projects, thus making the projects themselves very successful and meaningful. All those who participate in a particular project do this in a positive way and therefore actively support the project. 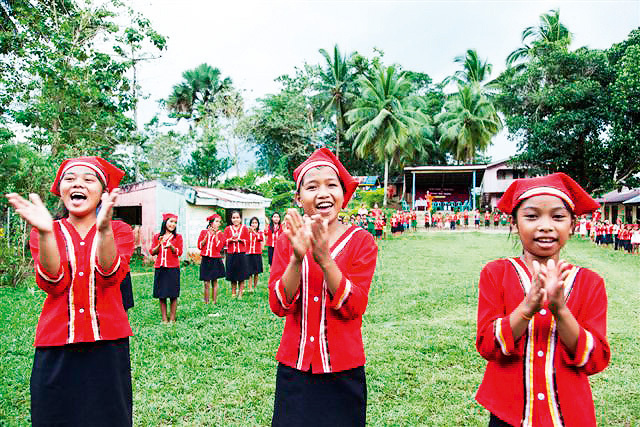 This is especially important in a municipality like Dumingag where the individual communities are widely spread apart within a perimeter of 50 kilometers. 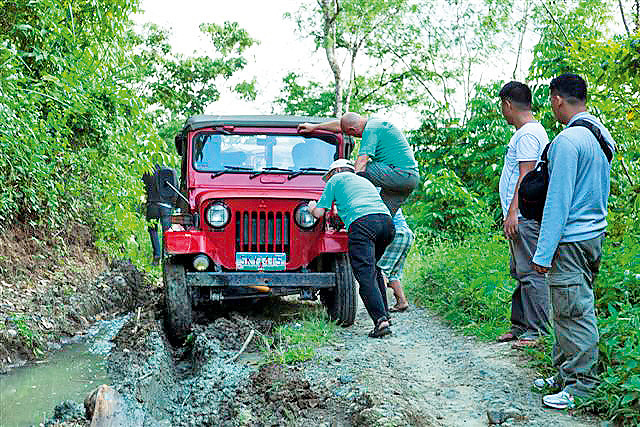 Physical access to some of the communities is further impeded by weather conditions, especially during the monsoon season. The key ingredient for this success is excellence at all educational levels from primary school to the university as well as the vocational training. We witnessed very highly motivated teachers who were also very interested in our lectures on organic agriculture and the dangers of GMO. 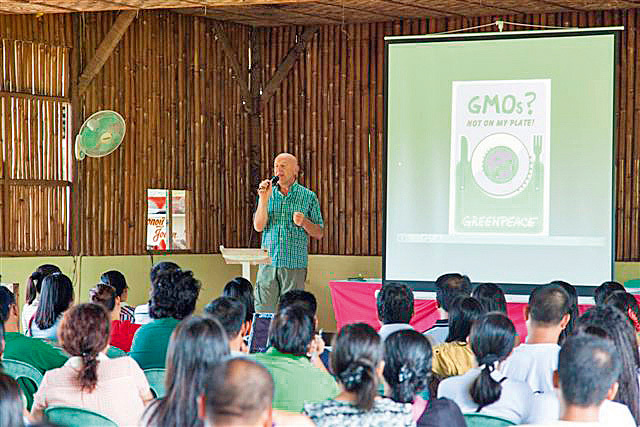 In addition to the general university of agriculture, Domingag also has its own “Organic Farming School”. In this school the students receive comprehensive training in organic cultivation methods. 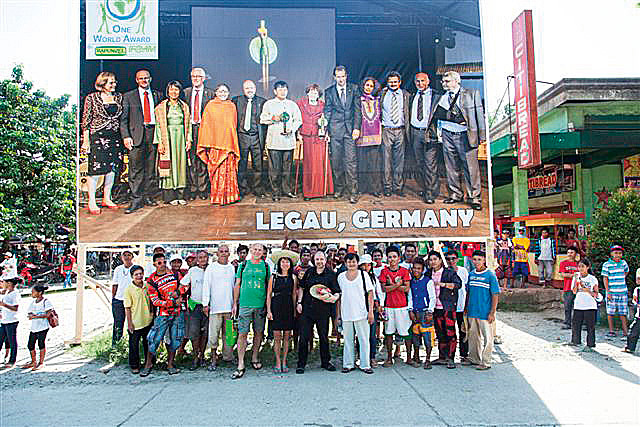 The annual organic and cultural festival is yet another of Dumingag’s successful activities. During the festival the best performances in a number of categories are honored and the winners receive practical rewards for example small farming appliances.